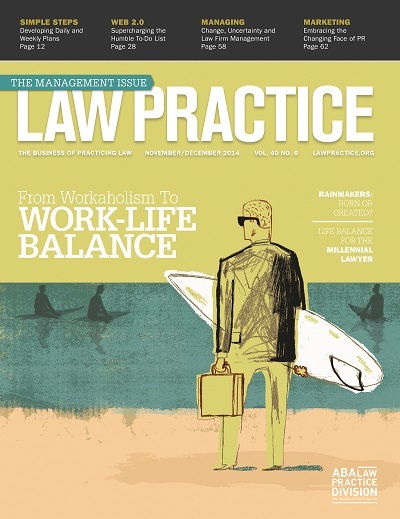 WMT: Is there commonality in marketing a law firm and a restaurant? In my monthly contribution to Web Marketing Today, I go off the reservation a bit (pun intended) in discussing Open Table, restaurants and customer service compared to professional services, law firms and client service. In Using Customer Reviews to Drive Sales, I discuss positive (and negative) customer service experiences and how the same concepts and data drive similar patterns for a law practice. Fine dining is a centerpiece in the health and well-being of my marriage. Every Saturday night is date night, come hell or high water, and with it one of many great restaurants in the Philadelphia metropolitan area. Regardless of how busy we get with work, travel and dealing with the kids, we take a few hours and a few bucks each weekend to partake in a nice dinner. It is our household’s major discretionary spend (and when you add wine and a babysitter, it adds up fast). Our Facebook followers know that each week they’ll be clued in on a new, hot or long-time favorite eatery for future consideration. 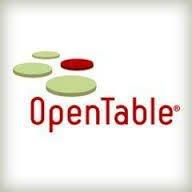 The chances of your restaurant being selected as a destination are heavily weighted by whether you show up on Open Table. I peruse the reservation options weeks in advance and look at my profile to remind myself where we are going over the next month or two. On the flip side, the participating restaurant gets to know a lot about me before I walk in the door–and that is where the possibilities of developing customer satisfaction and loyalty exist. 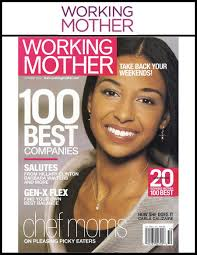 Perhaps this post is just an excuse to brag about my wife, Ivy Brown, who was recently honored as a Working Mother of the Year in the advertising industry by Working Mothers Magazine and the Advertising Women of New York. The event itself was pretty remarkable. There were more than 750 attendees in the grand ballroom of the Marriott Marquis in New York City. The tables were a who’s-who of leadership from blue chip companies–from Johnson & Johnson and Comcast to Facebook and Sony. The commissioner of the National Basketball Association was at the NBA table, honoring a working mom from his organization. A highlight was definitely watching the short video our kids put together to commemorate the occasion. They were asked the question, “what do you like to do with your Mom?” Lily, 9, scripted out the video with her brother Benjamin, 5. They put notes on a white board and had me videotape it (with an iPad) until they approved the final version (14 takes later). Talk about marketing. Besides the big screen at the awards, this video has appeared everywhere, from internal company newsletters to social media and in their classrooms at Moorestown Friends School. Lily’s performance earned her the gig of making the “lunch is served” announcement at the awards program (where she quickly memorized the cue card and showed no fear in standing on the stage in front of the crowd). The recent spate of class action lawsuits by unpaid interns seeking pay is disturbing. Perhaps it is yet another example of my own failure to fully understand millennials. Or maybe these young ‘ins don’t understand that they are crippling their own job prospects. Unfortunately, many will no longer get the chance to decide for themselves. For many premier companies and opportunities, internships will be a thing of the past. There has been lots of coverage about the legal underpinnings of these cases. And I was particularly intrigued by a guest blog post on Forbes.com from Jack Newhouse, a lawyer with Virginia & Ambinder in New York. He represents interns in lawsuits against Warner Music Group, Atlantic Recording, Chung King Studios, Viacom, Sony, Universal Music Group, Bad Boy Entertainment, Donna Karan, and Madison Square Garden Company. In his post, Unpaid Intern Lawsuits May Reduce Job Opportunities, Newhouse is basically instructing employers about the need to change with the times to avoid these payouts later. Instead, many employers are simply choosing to eliminate the internships altogether. But what he does not talk about is how damaging this is to the job prospects of many college kids entering the real world. The success that I had in developing my public relations and marketing resume was built around unpaid internships. From the Baltimore Blast of the Major Indoor Soccer League (MISL) while in high school to internships with the Philadelphia Fever, MISL league office and the Philadelphia Flyers in college. Yes, they were unpaid. Yes, there was some grunt work. I still recall the pain of preparing and copying the weekly press clippings for distribution to the Flyers’ brass. Boring! And additional “administrative” responsibilities that did not really enhance my portfolio. We called it “paying our dues.” And for each of those lackluster chores came the opportunity to write articles for Flyer Magazine, draft a press release, work hands-on with members of the media, and hang out in the press box. Law firm clients know how much I love the annual holiday card agenda items each summer. You can’t hear the sarcasm in reading a blog post, but it is there. Topics of political correctness, hard copy versus electronic, mailing list and CRM issues equate to multiple meetings and numerous arguments. These conversations are debated and renewed each year. And the harsh reality is that those cards–delivered anywhere from mid-December to early January often get lost in the flood of well wishes we each send out and receive. To be frank, if you do or don’t send me one–I likely won’t recall it. Of course, there are still cards that stand out from the crowd–for right and wrong reasons. I see some cards that I do feel are politically incorrect in the theme and message. Some firms have turned (successfully) to humor and use of e-cards–like Akin Gump and Manatt Phelps. I always receive an early Thanksgiving card from Bill Bowser and the employment law department at Young Conaway in Wilmington. It arrives before the others, thus stands out in the crowd. Infinite PR sends out a postcard with their holiday card allowing me to choose which charity they will make a donation to. That concept stands out as well. But it was a “first” for me that I enjoyed receiving via e-mail last week. 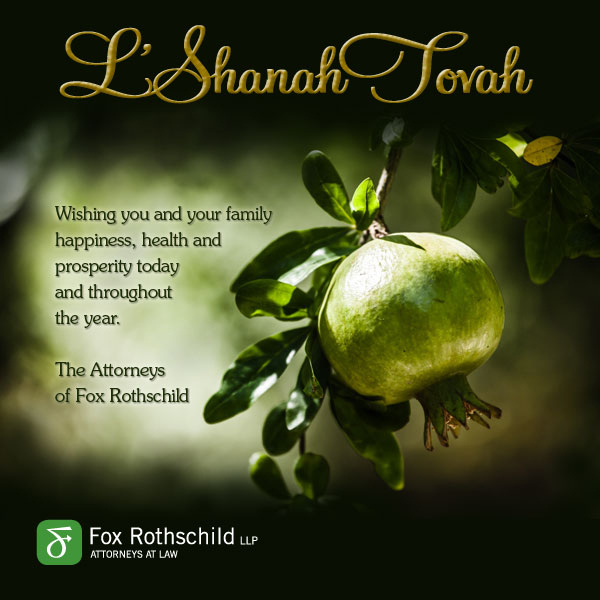 While driving to Baltimore on Erev (the first night of) Rosh Hashana, I received an e-card from Fox Rothschild wishing me a happy (Jewish) New Year. I enjoyed the greeting and the thought, and was impressed by the uniqueness of a holiday e-card that was outside the scope of the winter holidays, Thanksgiving and what most people consider New Year’s (on January 1…5774, by the way, is the 2013 year on the Hebrew calendar). Differentiation and standing out…that is what it’s all about. L’shana tova right back at you. 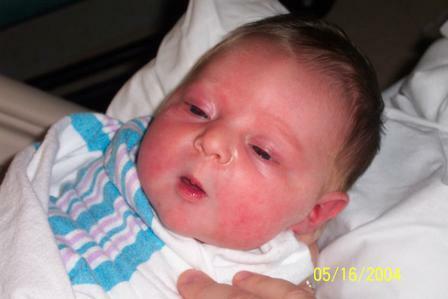 The Internet Marketing Attorney welcomed LIMA — the “Lil’ Internet Marketing Attorney” — to the world on May 15. Lily Helena Buchdahl weighed in at 7 lb., 6 oz.